Night Approximation: Proceed in the same way, taking into account the buoy markers: On the approach from Asturias, keep the light from Tapia lighthouse to port (Gp Fl(2+1)W 19s 24m, 18M); if you do so from Galicia, position yourself with the aid of the San Cibrao lighthouse (Gp Fl(5)W 20s 41m 20M). 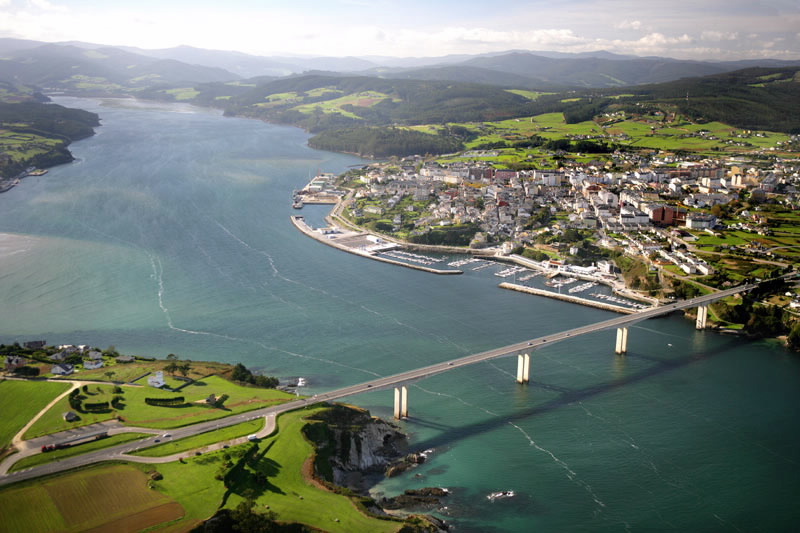 Once opposite the Ribadeo lighthouse (Gp Fl(3+1)W 20s 28m 21M) and Punta de la Cruz (Gp Fl(4)R 11s 18m 7M), look for the first lighted leading line, at Punta Arroxo, which takes you on TC: 140º (anterior IsoR 20m 5M and 228 m an posterior, 228 m from the anterior OcR 4s). The second leading line, on the Porcillán quay, plots TC: 205º to pass between the bridge pillars. The anterior light is QR 0.6s 10m 3M and the posterior, 177.7 m from the anterior, OcR 2s 20m 3M). The 3rd and 4th pillars of Los Santos Bridge (between which you must pass) are marked: to port Gp Fl (4)R 11s 10m 4M and to starboard Gp Fl(2)G 7s 10m 4M. 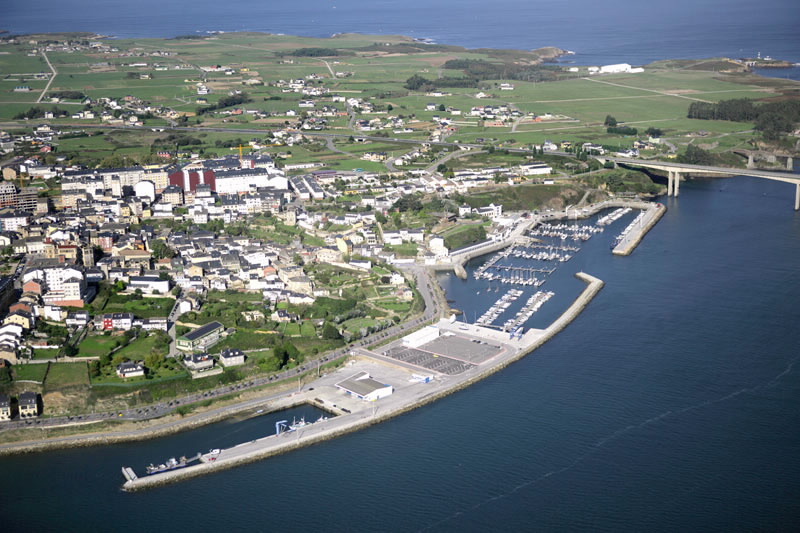 The entry to the Porcillán dock, where the marina is located, is marked by G Fl 5s and R Fl 5s. 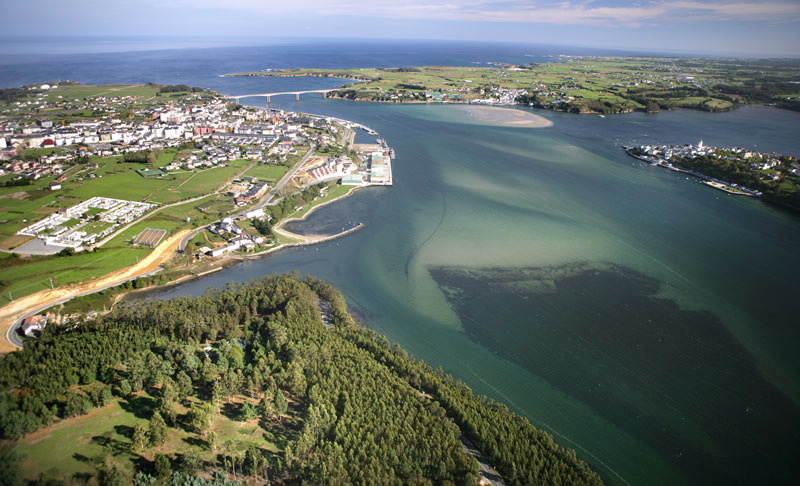 Day aproximación: To enter the port, you must make your approach with Isla Pancha (where the Ribadeo lighthouse is located) at a distance of one mile, and at 186º. At that point, take the Punta Castrelius - Punta Castropol leading line (TC=170º). 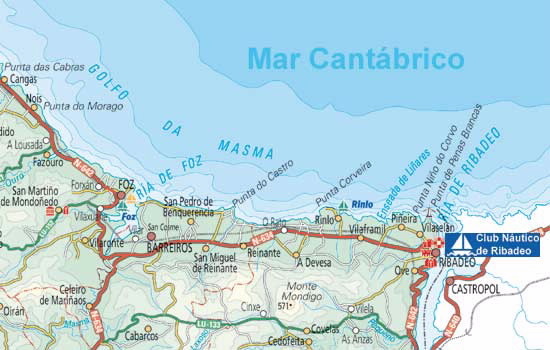 Once opposite Ribadeo Lighthouse - Punta de la Cruz, set a course for Punta Arroxo (TC=140º) until opposite Punta de la Cruz - García Quay (at the Yacht Club). 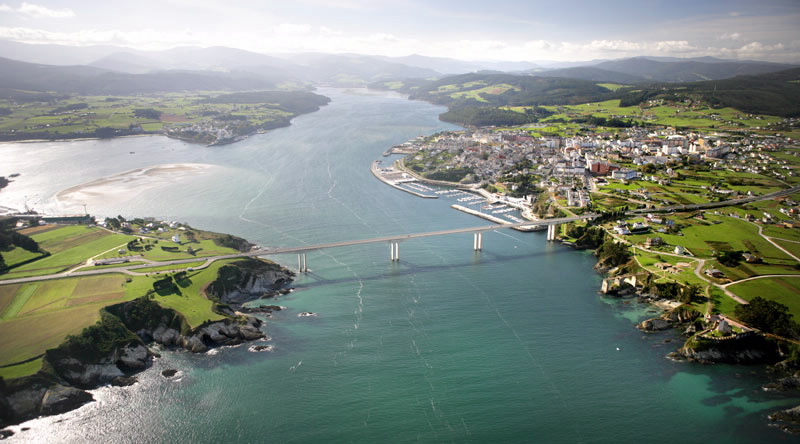 From there, sail on a bearing of 205º until you pass between the third and fourth pillars (counting from E to W) on Los Santos Bridge, which connects the Principality of Asturias with Lugo. Once you have passed that, set a course for the breakwater that protects the Yacht Club, which also serves as the holding quay.